WOW!! What a great idea! Are you tired of going to the dry cleaners? Worried you will not make it back before they close? Dirty garments just piling up in the corner of your room or in the trunk of your car? Or just forgetting that your clothes are at the dry cleaners? There is no job too big or small for us to come and pickup. And it is just one less thing for you to worry about. You pay no extra for the convenience of our dry cleaning pickup and delivery service. You’ll pay the same or less than almost any other dry cleaning store anywhere in South Jersey, plus, the time you’ll save is immeasurable. First order free up to $10 to give us a try. Try our service with no risk to you. Go to coupons for your $10 free coupon. 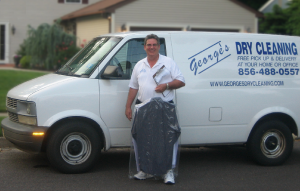 Created with the busy person in mind George’s Dry Cleaning will come to your home or office and pick up your garments to be dry cleaned at no extra charge to you. That’s right this service is absolutely free!!! Well known in the dry cleaning service industry and in business for over 22 years George has perfected the supreme treatment of his customers making them first in service. Taking a simple concept and bringing it right to your home or office. We are American owned and operated and customer satisfaction is our first priority just like the old days where the customer is always right. George will pick up between 8am and 8pm Monday through Friday.